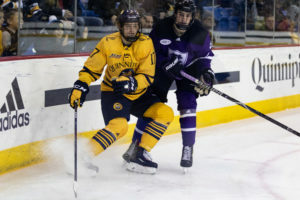 The Quinnipiac men’s ice hockey team skated to the tune of a 4-1 victory over Holy Cross on Tuesday night in Hamden to finish its out-of-conference schedule. Four different Bobcats found the back of the net and junior goaltender Andrew Shortridge made 25 saves in his 10th win of the year. In the opening frame, it was all Bobcats as Quinnipiac (18-5-1 overall, 7-4-1 ECAC Hockey) came out flying and peppered Holy Cross’ senior goalie Tommy Nixon with 18 shots, while only letting one shot get to Shortridge. Despite all the offensive pressure, only freshman forward Desi Burgart was able to get the rubber past Nixon, as after a slick pass from junior defenseman Brogan Rafferty, Burgart went bar-down over Nixon’s glove. The second period saw a bit of a shift, as Holy Cross controlled play for the first few minutes. That momentum was halted by Quinnipiac as a perfectly executed offensive faceoff led to junior forward Alex Whelan tipping senior defenseman Chase Priskie’s one-timer from the point and through the wickets of Nixon. Holy Cross closed the gap back to one when Shortridge misplayed a puck behind his own net and gave the puck right to junior defenseman Patrick O’Leary, who tucked it in the open net. But the Crusaders dug themselves in a hole with penalties as Quinnipiac scored two power play goals before the end of the period. First, freshman forward William Fallstrӧm was the recipient of a tic-tac-toe passing play by Quinnipiac’s second power play unit to put the Bobcats up 3-1. Then, with 47 seconds left in the period, senior defenseman Brandon Fortunato continued his hot streak with a shot from the circles that beat Nixon low to the blocker side. That would end all the scoring as an uneventful third period led to the 4-1 Quinnipiac victory. Rafferty and senior forward Craig Martin each finished with two assists. Looking ahead, the team is off this weekend, but will now have its whole focus on the ECAC Hockey race. Quinnipiac is in a three-way tie for first place with Cornell and Yale going into February. While going 1-0-1 against Cornell this year, Quinnipiac has yet to play its rivals in Yale. Quinnipiac won’t play again until February, when it heads to upstate New York to play Clarkson and St. Lawrence on Feb. 1 and Feb. 2, both games starting at 7 p.m.